Shout! Factory and Hasbro Studios have teamed up once again to release another new collection of episodes from the former Discovery Family series Littlest Pet Shop. 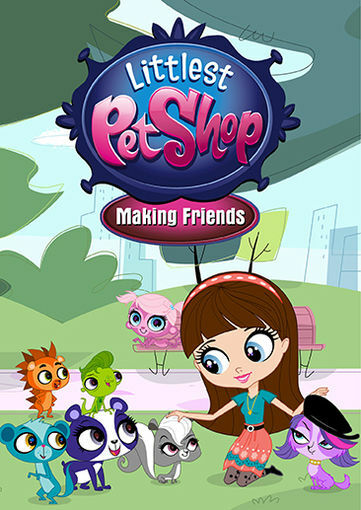 Littlest Pet Shop: Making Friends will be released in stores and online on Tuesday, June 14th. This latest collection features five more episodes from the former Discovery Family series. In this collection’s episodes, Russell challenges Sunil and Vinnie in a contest to entertain a new raccoon named Mr. VonFuzzlebut in “Sleeper.” Things don’t exactly turn out as any of them had planned, of course. And in the same episode Blythe’s furry friends face a threat from the outside when Fisher Bizkit sends his daughters to find out why Littlest Pet Shop is so successful. Blythe learns an important lesson about friendship in “Why Can’t We Be Friends” as she tosses away her old friends upon meeting a new friend. Meanwhile in the same episode Vinnie learns his own lesson about friendship when he befriends a spider even though Sunil, his original friend, is afraid of spiders. And in “Room Enough” Blythe has to deal with a very curious kitten while deciding on how to re-organize her room. These are just some of the stories presented in this latest collection. There is also a special two-part episode included in the collection that features a guest appearance from one Heidi Klum (America’s Got Talent). This entry was posted in DvD's and blu-rays, Internet, Television and tagged Discovery Family, entertainment, facebook, Hasbro Studios, internet, Phils Picks, Shout! Factory, Shout! Factory Kids, Television, Twitter, Wordpress by philspicks. Bookmark the permalink.